It won't frighten the horses, but we found the sound hard to get lost in, lacking musical insight. All the elements of a potentially excellent CD player are here, but the overall fine detailing is a bit lost in the process. The days are long gone when a 'Made in China' badge implied something flaky, but even by 2006 standards, this is an impressive bit of machinery. For a start, its considerable weight suggests care has been taken with assembly, and while the very thick front panel is arguably more to do with cosmetics than sound, the construction should do no harm when it comes to suppressing mechanical vibrations in the player. The way it's all designed, with flat panels screwed to substantial side pieces, is very nicely done. That theme continues inside the player, with a substantial metal case enclosing the transport. Removing the lid of this case reveals that the transport itself (basically a Philips model) has been beefed up with a metal bridge piece. Also, factor in the large and well made circuit board, which is glued into place at its edges, and it becomes apparent that physical construction is simply first class. Bodywork apart, the player's particular selling point is its use of valves in the audio output. Elsewhere, the circuitry uses a familiar DAC chip from Burr-Brown followed by a familiar selection of op-amps, and then suddenly there's a valve, or rather (since the two bottles are in fact both double triodes) a pair of them. Both sections are connected in parallel as a cathode follower, with the valve getting caned pretty hard in terms of power dissipation - over 2.5W per envelope. 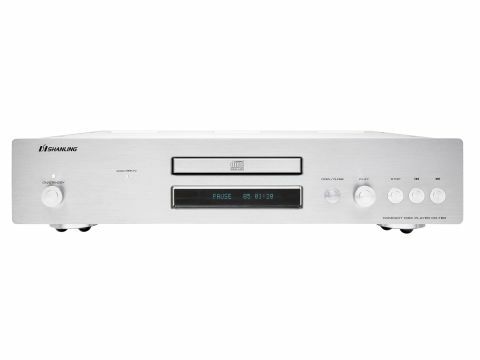 In case valves aren't enough to whet your appetite, the CD-T80 also offers digital volume control and switchable upsampling to 96kHz, both accessed exclusively from the remote. There's evidence from our panel's listening notes that they each tried hard to like this player but failed in the end to warm to it fully. Something about its sound just kept getting in the way of the music. How else to explain the frequent appearance of favourable comments about specifics - "nice tone on strings", "more detailed" and so on - followed a line or two later by words to the effect that there wasn't much sense of emotional connection? It seems to tick all the boxes yet fail to fill in the big picture. All the frequency range is clearly there, with the bass consistently found full if occasionally a little uncontrolled. Treble is extended and midrange presumably neutral as no one commented on it specifically - we certainly found little fault with it after the panel had left. Rhythm and pace are not alarmingly lacking, and dynamics seem reasonably lively. For all that, and despite some decent detail (though this is one specific that did get queried a few times), the sound just doesn't seem to gel. Some of the comments on imaging help explain this, for the orchestra was heard more as a single block rather than several neatly defined sections of players, and Damien Rice's backing was also a little homogenised. In fact, it seems that what is really lacking is insight, the way the best audio components have of picking out separate strands of a texture and preserving their tonal, dynamic and spatial individuality. This player is too general in its approach. While there's always something pleasant there to hear, the details that get one closely involved are not always present.